A global market requires manufacturers and distributors to stay on top of the many demands throughout the entire supply chain. High productivity, operational efficiency, and reduced costs are all necessary components to stay competitive. This can only be accomplished by connecting partners, suppliers and customers into an integrated system providing control and agility to continuously innovate and grow your organization. 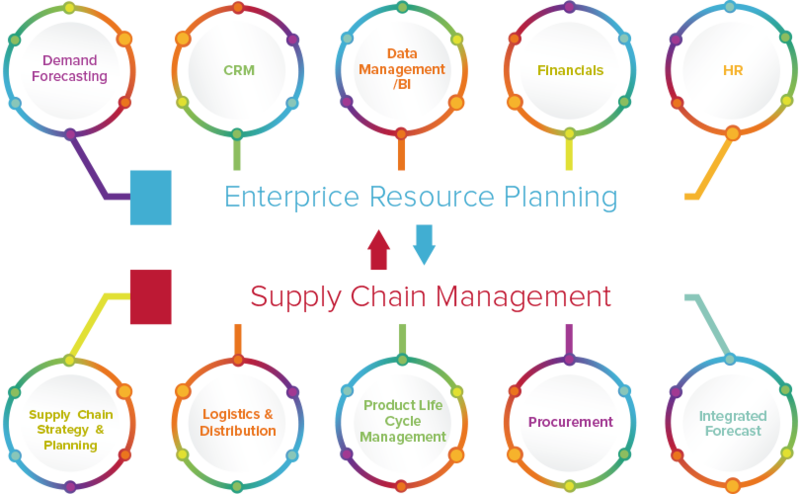 ERP and SCM solutions help organizations track and analyze key information, improve productivity, and drive accurate decisions. Organizations are now changing the way they conduct business by innovating new process and customer service practices. BI , CRM , SCM and ERP solutions are attaining a greater significance. Mainward provides solutions that help integrate corporate finance, human resources, manufacturing and distribution, supply chain management and logistics execution, enabling organizations make more accurate management decisions. We help identify, quantify and assist in planning an ERP and SCM implementation process and scalable transformation. We provide strategies for implementing new technologies in warehousing, transportation and reverse logistics that can result in cost reduction and improved customer service. We help improve your procurement operations to achieve better prices, greater efficiency, tighter spend control and improved service levels. By evaluating the needs and demands of customers and suppliers, Mainward can assist organizations in identifying areas that can achieve savings. We also help improve supplier management and development by creating performance-based measurement programs. Such programs are designed to create strong relationships with suppliers and improve collaboration in terms of reducing cycle times and the cost of materials and services. By leveraging our vertical industry-based expertise and full suite of services, Mainward can assist customers in identifying and augmenting specific collaborative behaviors to ensure they reap the full benefits of their ERP & SCM solution.